I love beets and I wanted to try making something from fresh beets this week. 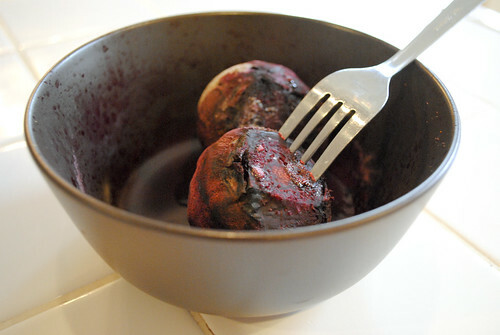 I have actually never seen fresh beets, I’ve always gotten them out of a can. I had to do some research on how to cook them, I found a lot of roasting, but I just don’t love turning on my oven for lunch. But I did find a few different instructions on how to cook them in the microwave. Make sure you pick a deep dish to microwave them in, because as you can see the water tends to splatter. 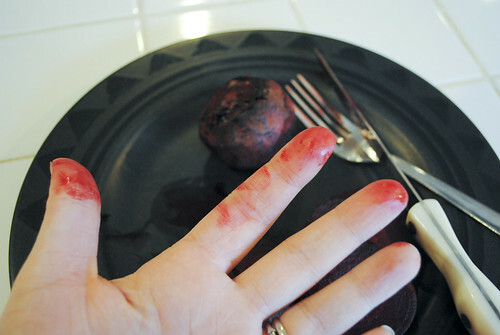 Be careful while cutting your beets as you can see, everything turns pink with the juice. I actually laughed as I worked with them and saw my fingers turn a bright pink. Rinse the beets and cut away all but an inch of the stalks. 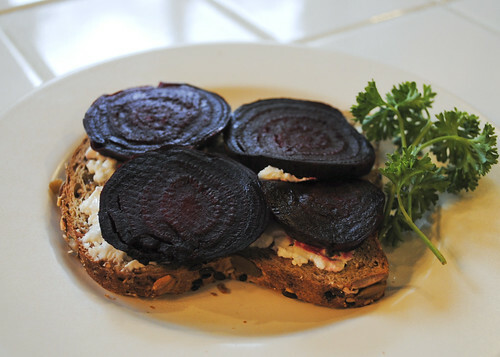 Place beets over goat cheese and enjoy! This sounds really good and I just happen to have some golden beets in my fridge that I dont know what to do with! Thanks for the idea! Oh I wonder if golden beets are a little less messy?